Portuguese goth-metal collective MOONSPELL are back with their eleventh album, the lush, tuneful and often beautifully constructed "Extinct". By now, this band has figured out how to write catchy songs, and they hardly need barking vocal congestions to be effective, much less heavy. Unfortunately, those remain and intrude upon the otherwise substantial, rock-driven material MOONSPELL has to offer here. The pop-flirting "Breathe (Until We Are No More)" mixes between soft and elegant verses and harder choruses with Fernando Ribeiro's blended singing and ralphing. Pedro Paixao's keys and synthetic strings dress up the lacing verses where Ribeiro chimes his most seductive octaves then pits his violent yelling against them on the sweeping choruses. "Extinct", the heavier title track marches with muscular riffs from Ricardo Amorim, Pedro Paixao and Aires Pereira as Ribeiro changes vocal schemes, shoving his broiled hollers all over the verses as he sweeps into Peter Steele-esque cleans on the choruses. At least the stitching guitar solo is a killer touch behind the song's melodic force. The peculiarly titled "Medusalem" nevertheless rocks with Miguel Gaspar's steady tempo as the brushing riffs chug on behind Fernando Ribeiro's dropped-back Andrew Eldritch impressions on the verses. He picks his octave a notch (without growling) on the breezing choruses to the suspended keys and the song moves efficiently even at five minutes, embellished only with a long guitar and key solo. "Domina" afterwards floats on a dialed-back groove and pirouetting guitar lines, giving Fernando Ribeiro a wistful platform to seduce his audience, sealing the deal on the song's spacious and exhilarating choruses — once again without growling. MOONSPELL gives HIM a good run for the money with the harmonious, straight-playing goth rocker "The Last of Us", a singles-minded number running at a tidy 3:26. Ditto for the shaking thrusts of "Funeral Bloom" and "A Dying Breed", albeit Fernando Ribeiro's intermingled yelling amidst his Eldritch shakes would block these cuts from becoming true singles. Nowhere near as compelling despite the shake-up intent of the songwriting is the laborious "Malignia", which crawls a bit too tenderly and becomes unfastened by Fernando Ribeiro's needless snarling sections despite Pedro Paixao's alluring keys. 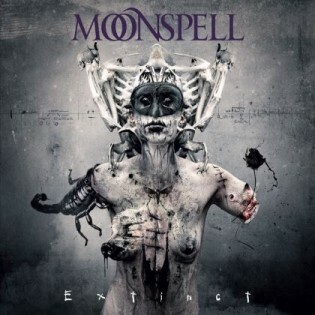 What MOONSPELL has done over the years is largely good and often great. For their fans, "Extinct" is going to be one gothic pleasure pill after another. Still, for their vivacious song structuring and lashing harmonies, they suffer from the needless death growls that have grown out of place given where they are as musicians.